Place the carrot and vinegar in a medium bowl and toss to combine. Set aside to pickle for 10 minutes, stirring occasionally to coat the carrot. Heat the oil in a large frying pan over high heat, add the tempeh and cook, stirring, for 6 minutes or until lightly browned. Add the garlic, oyster sauce, sriracha, salt, pepper and half the peanut. Cook for a further 2 minutes. 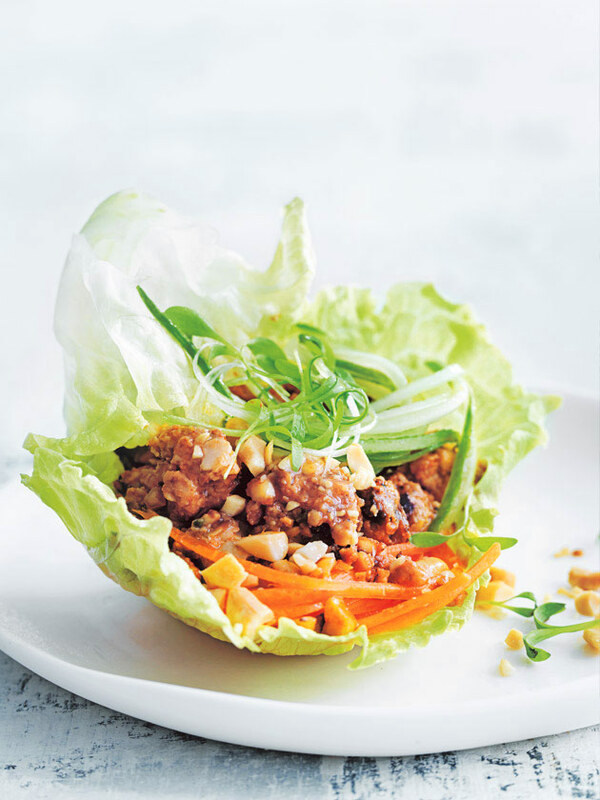 Divide the carrot, tempeh, cucumber and onion between the lettuce cups. Top with the coriander and remaining peanut to serve. Makes 6. + Tempeh is a product made from soybeans, similar to tofu, that originates in Indonesia. It’s a good source of protein, and is available in the refrigerated section of supermarkets and health food stores.